Teleconsultation – a remote telemedicine consultation service that provides a round-the-clock medical advice via a video call with Samitivej’s doctors and nurses. Test@Home – patients can have their blood samples taken in the comfort of their home and blood samples will be sent to the laboratory immediately. Medicine Delivery – medication will be delivered to patients with absolute data security as Samitivej adheres to the data protection standards mandated by the Health Insurance Portability and Accountability Act (HIPAA). Samitivej Virtual Hospital will be available from April 1, 2019, with services on offer 24 hours a day, 7 days a week. The consultation fee is 500 baht (approx. US$15.78) per 15 minutes and patients using the service will receive a 20% discount on medications. In addition, the services of the Samitivej Virtual Hospital do not require appointments to be made in advance. 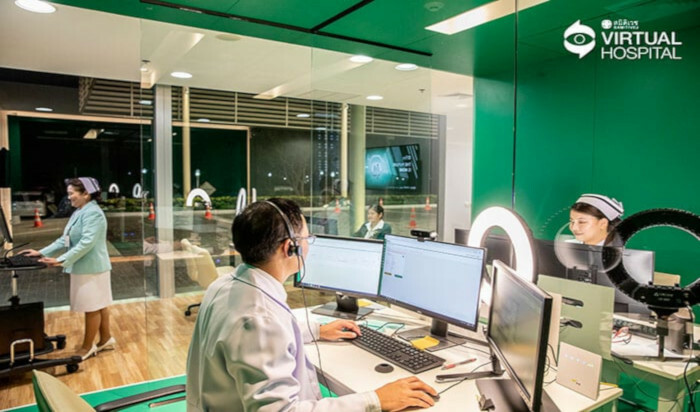 Samitivej Hospital Group teamed up with six leading companies to launch the virtual hospital services: Advanced Info Service, Line Thailand, Muang Thai Life Assurance, Siam Commercial Bank, Sansiri and SCG Cement-Building. There is also a Samitivej Virtual Hospital control room (see featured image) located at Samitivej Srinakarin Hospital that has been designed with the specific purpose of enhancing the Samitivej Virtual Hospital experience. “A significant challenge in today’s healthcare industry is to move beyond digital disruption and service providers need to keep up with trends, innovate and develop new service models to continuously meet the needs of consumers in all sectors,” said Chairat Panthuraamphorn, Managing Director and Chief Executive of Samitivej Hospitals and BNH Hospital in a statement. There are also plans to expand the Virtual Hospital service to BNH Hospital in the future, he added. Last month, BC Platforms announced that it will be providing its genomics platform to Bumrungrad International Hospital, a private multiple-specialty medical centre founded 1980 in Bangkok. In January this year, the Thai government added medicine, medical supplies and medical services to its price control lists. While there has been outcry from the private hospital industry that the price controls would adversely affect Thailand’s reputation as a medical tourism hub, the effects of the price controls remains to be seen.